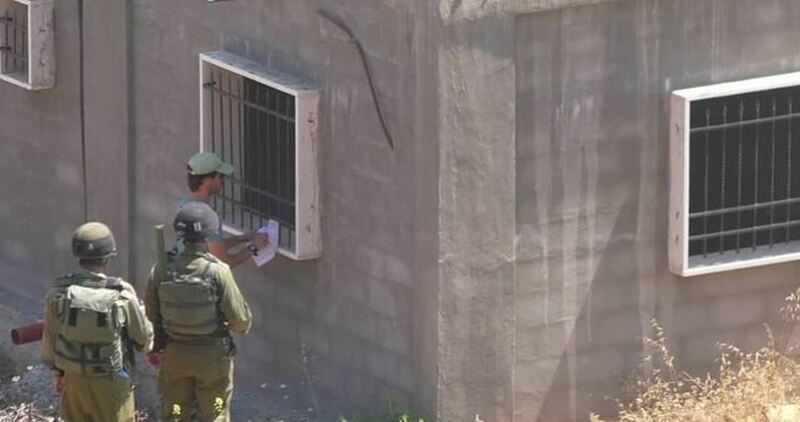 The Israeli Occupation Forces (IOF) on Tuesday issued several demolition orders against a number of Palestinian facilities, including a clinic, in Yatta town to the south of al-Khalil, said local sources. According to Rateb Jabour, coordinator of the Anti-Settlement Committee, Israeli forces handed two Palestinians demolition orders of two residential units and a shed as well as a demolition order of a clinic that serves the people in the area under the pretext of being built without permit. The notified facilities are located in Sha’ab al-Batm area, to the east of the town. The area has been subjected to multiple attacks by Israeli settlers. Dr. al-Qedra added that the soldiers also shot and killed one medic, and injured 323 others with live fire and gas bombs, in addition to causing damage to 37 ambulances. The Palestinian Ministry of Health in Gaza issued an updated count of Palestinian casualties since the “Great March of Return” began on March 30th in the besieged Gaza Strip. Israeli soldiers invaded, on Saturday at night, many neighborhoods in occupied East Jerusalem, and opened fire at protesters, in addition to attacking Palestinians holding social activities, celebrating the holy Muslim month of Ramadan. Media sources in Jerusalem said the soldiers invaded several neighborhoods in the occupied city, and fired gas bombs and concussion grenades at Palestinians, who protested the invasion. The soldiers also imposed much harsher restrictions on the Palestinians in the city, while Israelis celebrate Shavuot Jewish holiday. In addition, the soldiers attacked dozens of Palestinians holding social and religious activities, celebrating the holy month of Ramadan, in Bab al-‘Amoud and Bas as-Sahera of the Old City. The Palestinians were attacked by soldiers and mounted officers, who invaded the two areas, and resorted to the excessive use of force against them. 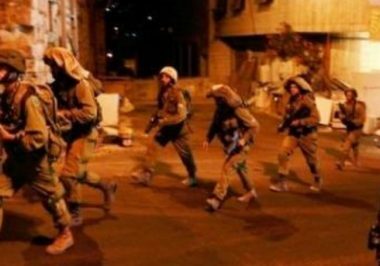 In addition, the soldiers invaded the many neighborhoods in Silwan town, south of the Al-Aqsa Mosque in the occupied city, and attacked Palestinian protesters. The soldiers also invaded Hizma and al-‘Isawiya towns, and fired gas bombs and concussion grenades at many Palestinians, who protested the invasion. It is worth mentioning that the soldiers also briefly invaded the al-Makassed Hospital, in at-Tour neighborhood overlooking the Old City. 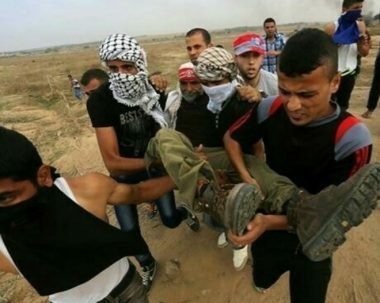 The Palestinian Health Ministry has confirmed that Israeli soldiers injured, Friday, 56 Palestinians during the Great Return March which was held in several parts of the Gaza Strip, and adding that twenty-three of the wounded Palestinians were shot with live rounds. The protests were held near border areas in several parts of the border fence, in the eastern part of the besieged and impoverished coastal region. 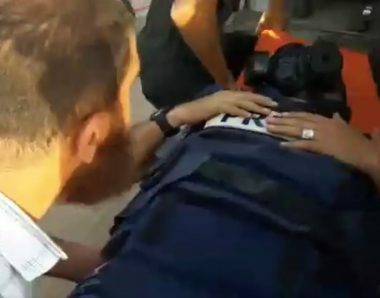 Three of the wounded are two journalists, and one medic. The Health Ministry said Israeli army sharpshooters shot at least twenty-three Palestinians, when the soldiers attacked the nonviolent protesters, and also fired dozens of gas bombs. Ten of the Palestinians who were shot with live fire were injured east of the Zeitoun neighborhood, in the eastern part of the Gaza Strip, and were rushed to the Shifa Medical Center, suffering moderate-but-stable wounds. Five Palestinians were shot, also with live fire, east of Rafah city, in the southern part of the Gaza Strip, and were moved to Abu Yousef Najjar Hospital. 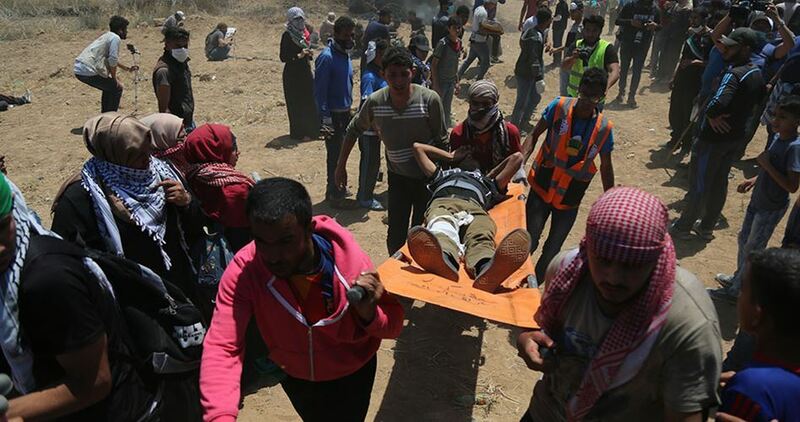 Five Palestinians were shot with live fire east of Khuza’a town, east of Khan Younis, in the southern part of the Gaza Strip, and were moved to the European Hospital. One of them is a journalist who was shot in his leg. Three Palestinians were shot with live fire, east of Jabalia, in northern Gaza, and were moved to the Indonesian Hospital in nearby Beit Lahia. The soldiers also caused many Palestinians to suffer the effects of teargas inhalation, in several parts of the coastal region, including near the al-Boreij refugee camp, in central Gaza. 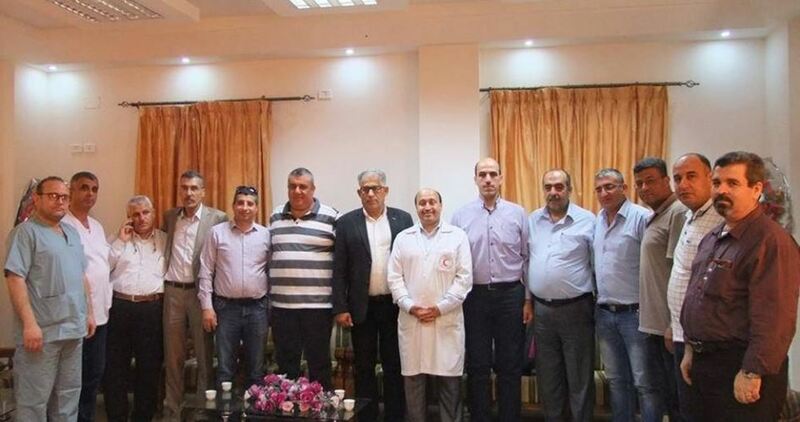 A medical delegation from the West Bank headed by Dr. Fadel al-Batran, a neurosurgery specialist at the Palestine Medical Complex, arrived on Thursday at al-Shifa Hospital in the Gaza Strip. Dr. Zuheir Nofal, director of the nursing department at al-Shifa Hospital, briefed the delegation on the great efforts made by Gaza's Ministry of Health in general and al-Shifa staff in particular in the treatment of those injured in the protests despite the acute shortage of medical supplies and drugs. 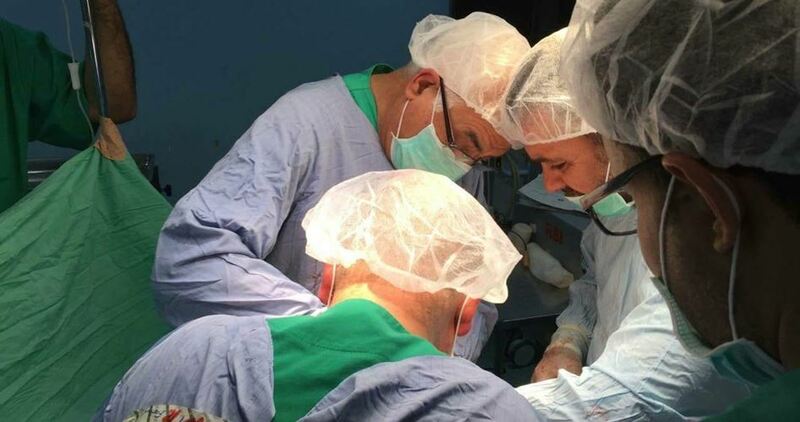 The medical delegation includes specialists in neurosurgery, vascular surgery, and pediatric surgery as well as an emergency doctor, and they are scheduled to stay in Gaza for three days. Prime Minister Justin Trudeau said that his country deplores and is gravely concerned by the violence in the Gaza Strip that has led to a tragic loss of life and injured countless people. In a press statement on Thursday, Trudeau said “We are appalled that Dr. Tarek Loubani, a Canadian citizen, is among the wounded, along with so many unarmed people, including civilians, members of the media, and children." "We are doing everything we can to assist Dr. Loubani and his family, and to determine how a Canadian citizen came to be injured. We are engaging with Israeli officials to get to the bottom of these events”, he added. Trudeau demanded Israel's leaders explain how a London, Ont. doctor tending to injured protesters was caught in the crossfire, while throwing his support behind calls for an independent investigation. Over 1,000 children have been injured by Israeli forces in the besieged Gaza Strip during demonstrations since March 30, according to the UN Children's Fund (UNICEF). The UN body pointed out that some injuries had been severe and potentially life-altering, including amputations. "Recent violence has exacerbated the already weak health system in the Gaza Strip, which is crumbling because of the severe power cuts and shortages of fuel, medicine and equipment," UNICEF said in a statement. "Medical facilities are buckling under the strain of additional casualties," it further warned. On Wednesday, UNICEF and its partners delivered two truck-loads of urgent medical supplies to the Gaza Strip for an estimated 70,000 people. Egypt's al-Azhar Mosque on Tuesday evening announced that it will send an urgent aid convoy to the Gaza Strip after 62 Palestinians were killed and over 3,000 injured in an Israeli massacre near Gaza's eastern border. The convoy includes about 50 tons of food and humanitarian aid in addition to two vehicles loaded with medical supplies especially those needed for surgeries and emergency cases. 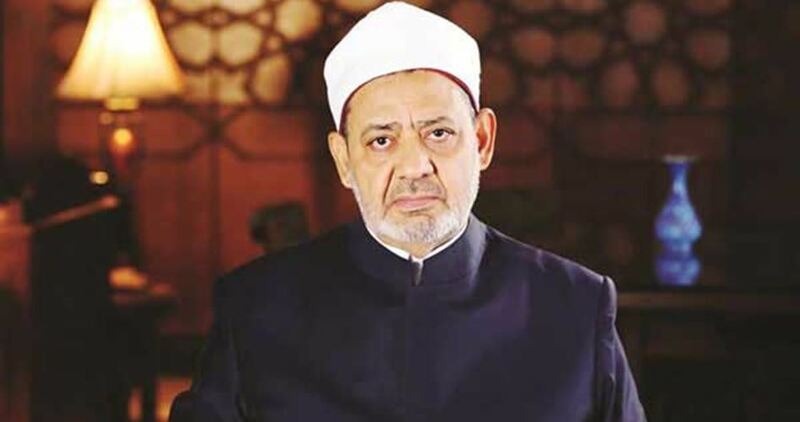 Al-Azhar al-Sharif issued a statement Monday condemning the heinous crimes committed by the Israeli occupation forces against the Palestinian people in Gaza. Al-Azhar said in its statement that the Israeli forces deliberately targeted unarmed demonstrators while they were marching peacefully on the 70th anniversary of the Nakba killing dozens and injuring hundreds. Al-Azhar Observer for Combating Terrorism condemned the US embassy transfer to Occupied Jerusalem, saying that what Washington did is an aggression on the rights of the Palestinian people. Al-Azhar Observer said that relocating the US embassy is a kind of political extremism and a violation of international conventions that undermines any possible peace process in the region and paves the way for more violence and instability. 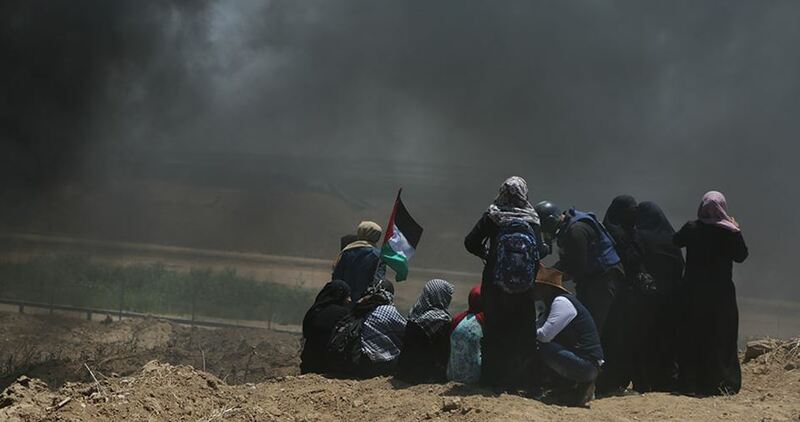 At least 62 Palestinians were killed and about 3,188 injured in Gaza on Monday after the Israeli occupation forces targeted the civilians protesting in the eastern border areas with live ammunition, rubber-coated metal bullets and teargas canisters. Palestinians marched in Gaza on Monday mainly in protest at the US embassy transfer to Jerusalem in accordance with a decision issued by the US president Donald Trump on 6th December 2017. Trump's decision has stirred widespread Palestinian and international resentment. The Palestinian Authority, for example, decided to freeze its political relations with the US administration, while the UN General Assembly adopted a resolution rejecting attempts to alter the legal status of Occupied Jerusalem. The High Commission for the March of Return and Breaking the Siege appealed for urgent action to provide Gaza’s poorly-equipped hospitals with much-needed medicines and medical kit. In a Monday statement, the commission appealed to the Ramallah-based Health Ministry, Egypt, and international organizations to urgently send medical staff, surgeons, and medicines to Gaza so as to save the lives of thousands of civilians critically wounded by Israeli gunfire. The commission said dozens have been killed and hundreds injured in less than 24 hours, resulting in an acute dearth in medicines and medical equipment in the besieged coastal enclave. At least 59 Palestinians have been killed and 2,710 injured after the Israeli military aggressively attacked marchers at Gaza’s border. The Israeli occupation authorities on Sunday decided to prevent a Palestinian medical delegation from entering the Gaza Strip. Ministry of Health said in a statement that the Israeli authorities refused to issue the necessary entry permits for the members of the medical delegation formed by the Palestinian Minister of Health in Ramallah Jawad Awwad to assist medical staff in Gaza. The Ministry stressed that this ban is a further crime committed against the Gazan people who are also prevented from travelling abroad for treatment. 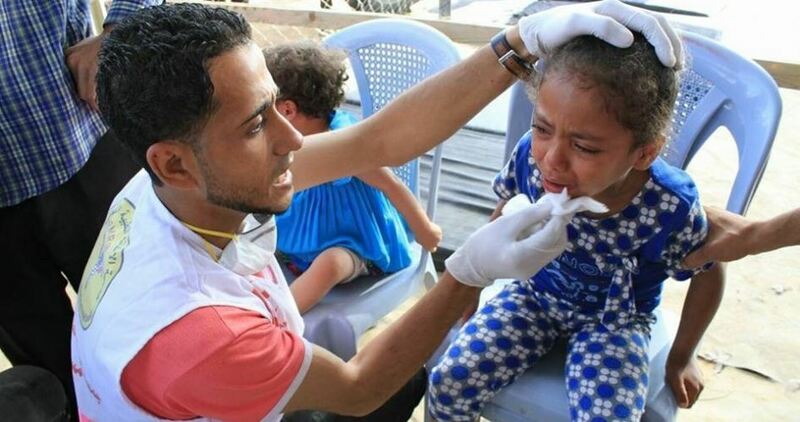 The Ministry called on international organizations to pressure Israel to allow medical teams to visit Gaza and help the staff working there. The Israeli Occupation Forces (IOF) continued to deliberately target Palestinian children, journalists, and medics while suppressing the Return March protests along Gaza border, medical sources said. Spokesman for Palestinian Health Ministry in Gaza Ashraf Qudra called on international organizations to immediately intervene and put an end to the Israeli systematic targeting of Palestinian children during the Great March of Return protests. He also pointed out to the deliberate targeting of Palestinian journalists and medical crews along Gaza eastern border. 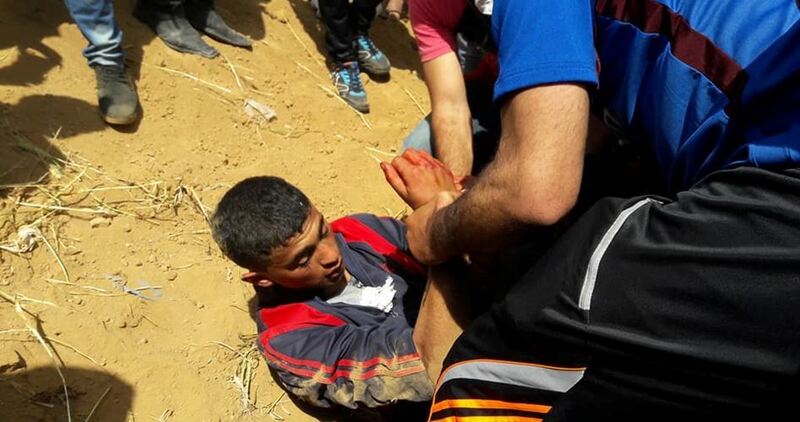 So far 53 peaceful protesters have been killed, six of whom are being detained by Israel, and over 8,000 injured after being shot by IOF near Gaza's eastern border since the start of the Great March of Return on March 30.